Maugersbury is a very small pretty village with wonderful views less than a mile south east of Stow-on-the-Wold and lies within the Cotswolds Area of Outstanding Natural Beauty. Bourton-on-the-Water is a large and very pretty village, attracting many visitors and day trippers it becomes very busy during the summer months. It is known as the Venice of the Cotswolds because of the bridge-spanned River Windrush that runs through the centre. There are plenty of attractions here for all the family including the Birdland Park and Gardens, Dragonfly Maze, the Modal Railway, the Model village, the Cotswolds Motoring Museum, the Cotswold Carp Farm, a farmers’ market on the fourth Sunday of each month and during the summer a game of medieval football is played with goalposts set up in the River Windrush itself. There are plenty of benches on the wide grassy banks along both sides of the shallow river making it a fantastic place for a paddle or just to sit, relax and watch the world go by. The River Windrush flows for 40 miles from the Cotswold Hills into Oxfordshire and it meets the Thames at Newbridge. Within Bourton there are 117 buildings that have been designated as having Grade II or higher listed Status. The Slaughters are the idyllic small twin villages of Upper and Lower Slaughter just south west of Stow-on-the-Wold. Since 1906 the two villages have remained unchanged and straddle the banks of the River Eye which is also known as Slaughter Brook. The name Slaughter has nothing to do with blood or killing but derived from an old English word Slothre simply meaning “muddy place”. The river, at Lower Slaughter, with its little stone bridges is bordered by 16th and 17th century yellow limestone cottages built in the traditional Cotswolds Style. The main feature of the village is the restored 19th century flour mill with an original working waterwheel and a chimney for additional steam power. The mill which went into decline in 1958 is now a museum, gift shop and tea room. The village is home to a 13th century Anglican Church dedicated to St. Mary the Virgin built in 1866. The Lower Slaughter Manor built in 1658 for the High Sheriff of Gloucestershire is now a grand Country House Hotel. The Oxfordshire way is a long distance walk which runs for 68 miles starting in Bourton-on-the-Water and finishing at Henley-on-Thames. With 6 miles of the route in Gloucestershire and some short sections in Buckinghamshire it passes through two Areas of Natural Beauty the Cotswolds and the Chiltern Hills and also links with the Heart of England Way and the Thames Path. The Warden’s Way is a 14 mile long footpath which starts at Winchcombe, makes its way into the surrounding hills and passes through some of the most attractive villages and hamlets such as Guiting Power, Naunton and the Slaughters before finishing at Bourton-on-the-Water. We park at the side of the road in Maugersbury and walk towards the telephone box and turn right just after the post box. We follow the little road and after bearing round to the right we turn left and head forwards downhill on the tarmac track crossing over the old dismantled railway line to pass Oxlease Farm. We keep following the track which has now become stony until we reach a small road. We turn right and follow this road for about 10 minutes until we reach the main road. We turn left uphill for a short way then turn right at the public footpath sign and following the main track through the trees. We keep bearing right until we come to a gate across the road and turn right just before the gate. We soon come out into the open and bear round to the left with the tree line on our left and keep heading forwards until we come to a small road. We now turn right then after a short way we turn left just before a post box and signposted Bridle Way and Oxfordshire Way. We go through a gate and head forwards following the path through the fields after crossing bridge over a stream we enter into Greystones Farm Nature Reserve. We cross over another bridge and keep heading forwards. We come to a cross roads of paths and turn left through the gate sign posted Lakes. We head forwards through the field go through a gate and after passing through a second gate we turn left and immediate left again through a small gate onto a wooden walkway called the Archaeology Walk. We heads forwards following the boards and then the edge of the lake until we reach a wide gate, we go through the small gate on the left. We follow the track bearing off to the right passing Bury Barn Farm and Cottage then just after the allotments we turn left and follow the track until we reach the road at Bourton-on-the-Water. With Birdland in front of us we turn right and follow the path by the side of the River Windrush through the village centre until we come to the church. We turn right and follow the footpath the Warden’s Way by the side of the church and keep heading forwards past the school until we come to a road. We turn left then right at the traffic lights and after a short way we turn left crossing the road to follow the track on the Warden’s Way to Lower Slaughter. At Lower Slaughter we follow the little stream round to the left passing the church on our right to visit the mill. We then make our way back to the church and turn left. At the end of the church yard just before the bend in the road we turn right then left just before the houses and head forwards, passing the cricket club, through the fields following the Macmillan Way. We go through a gate and keep heading forwards and when we see a water tank we turn left through the hedge then make our way through the field following the yellow arrows on a stranded gate. We then turn right, the farm is on our left, and head down a long field. We are now on the Monarch’s Way and Gloucestershire Way. At the end of the field we turn left through the gateway then bear right over a stile. We head forwards to go through at gate next to a stream then cross a little bridge to reach some buildings. We go through a gate and turn right round the back of an old mill cross over a bridge and bear left towards the buildings in the distance below the trees. We keep heading forwards passing Nether Swell Cottage on our left then uphill to go through a gate and some trees to the main road. We turn left and follow the road using the pavement to Stow-on-the-Wold. We keep heading forwards through the traffic lights and then turn right at the next junction and the telephone box onto High Street. We walk through Stow-on-the-Wold across the square then head down the one way street, named Digbeth Street, to the junction with the main road. We turn left, cross the road and turn right at the sign post for Maugersbury ½. We head forwards on the track with the car park and public toilets on our left. After about 10 minutes we arrive back in Maugersbury and our parked car. This is an easy walk through fields, on tracks and some small roads. There are some slight inclines and declines. Elevation: Approx lowest point 128m (420ft) Approx highest point 242.6m (796ft). Approx 11 miles allow 4 hours using OS explorer map OL45, The Cotswolds. Stow-on-the-Wold in the Cotswolds, Gloucestershire. From the M40 take junction 15 then take the A429 to Moreton-on-Marsh and Stow-on-the-Wold. At the traffic lights at Stow turn left onto the A436. At the junction to the main road turn left and immediate right at the road sign for Maugersbury. Free roadside parking. There are several car parks in Stow one with a parking charge from 50p for ½ an hour to £2 for three hours. There is limited free parking in the square, on the road side and at Tesco supermarket on the outskirts of the town. 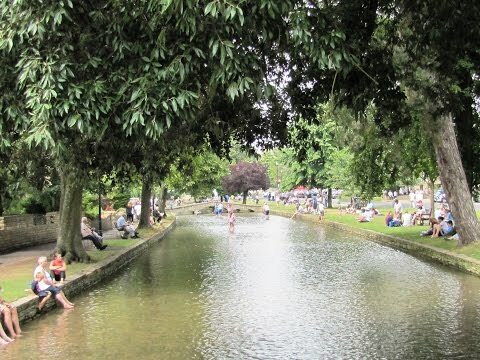 There is also a pay and display car park at Bourton-on-the-Water which is variable hourly rate Mon – Tues and £6.50 flat rate on Sundays there is also some road side parking. There are public toilets in the Market Square and in Maugersbury Road at Stow-on-the-Wold and in the car park at Bourton-on-the-Water. For refreshments there are ample shops, cafes, tearooms, pubs and restaurants in both Stow and Bourton.